Benchmarks and Investment Management. Research Foundation of CFA Institute, Charlottesville, Va., 2003. 1. A suite of commentaries on this book, by Theodore Aronson, Peter Bernstein, Barclay Douglas, Richard Ennis, Elizabeth Hilpman, Barton Waring, Arnold Wood, and Jason Zweig, can be read here. Life-Cycle Investing, Volume 3: Financial Education and Consumer Protection, with Zvi Bodie and Lisa Stanton. Research Foundation of CFA Institute, Charlottesville, Va., 2012. Rethinking the Equity Risk Premium, with P. Brett Hammond and Martin L. Leibowitz, Research Foundation of CFA Institute, Charlottesville, Va., 2011. Insights into the Global Financial Crisis. Research Foundation of CFA Institute, Charlottesville, Va., 2009. Summarized in The CFA Digest, February 2010. The Future of Life-Cycle Saving and Investing: The Retirement Phase, with Zvi Bodie and Rodney N. Sullivan. Research Foundation of CFA Institute, Charlottesville, Va., 2009. The Future of Life-Cycle Saving and Investing, with Zvi Bodie and Dennis McLeavey. Research Foundation of CFA Institute, Charlottesville, Va., 2007. Summarized in The CFA Digest, February 2008. Stocks, Bonds, Bills, and Inflation Yearbook (annual), Ibbotson Associates, Inc., Chicago, 1984-1994. “Confronting the Big Questions,” The Journal of Investing, March 2017. “McKinsey Assesses Future Stock and Bond Returns: Are the good times really over for good?,” AJO, May, 2016. “Phooey on Financial Repression,” with Thomas S. Coleman, AJO, September, 2015. “The Inventor of Behavioral Finance Looks Back,” Advisor Perspectives, June 23, 2015. “The Inventor of Behavioral Finance Looks Back,” AJO, June 23, 2015. “Can We Recover from the Public Debt Crisis? Of Course We Can,” Advisor Perspectives, June 9, 2015. “Can We Recover From the Public Debt Crisis? Of Course We Can,” AJO, June 9, 2015. “The Final Say on Spending Rules,” AJO, March 31, 2015. “Individual investing using an economic balance sheet and the Waring-Whitney CAPM,” with M. Barton Waring. In progress, 2013. “Building goal-driven investment portfolios for households,” with Andrew Rudd. In progress, 2013. “Alternative Investments in DC Retirement Plans: Opportunities and Concerns”, Sexauer, Stephen C., and Laurence B. Siegel, forthcoming, Journal of Retirement, 2014. “The Tooth-Fairy Economics of Jeff Madrick,” Advisor Perspectives, December 2, 2014. “Read Your Sharpe and Markowitz,” CFA Institute Magazine, September-October 2014. “Without fear of commitment: The role of high-conviction active management,” with Matthew H. Scanlan. Journal of Investing, Fall 2014. “How to Confront the End of the Bond Bull Market,” (Review of Simon Lack’s Bonds are Not Forever), AJO, March 25, 2014. “How to Confront the End of the Bond Bull Market,” (Review of Simon Lack’s Bonds are Not Forever), Advisor Perspectives, March 25, 2014. “Morningstar Conversation With Laurence Siegel & Michael Falk”, by Paul D. Kaplan, AJO, January 22, 2014. “Alternative investments in DC retirement plans: Opportunities and concerns,” with Stephen C. Sexauer. Submitted to the Journal of Retirement, 2014. “A Framework for Understanding Bond Portfolio Performance,” Advisor Perspectives, December 10, 2013. “A Framework for Understanding Bond Portfolio Performance,” AJO, December 10, 2013. “Sometimes There Really is a Wolf: Inflation and Bond Market History and Prospects,” Ounavarra Review, November 2013. “Forecasting Bond Returns and Evaluating Bond Funds,” October 8, 2013. “Sometimes There Really Is A Wolf: Inflation And Bond Market History And Prospects”, Ounavarra Review, October 2013. “Sometimes There Really is a Wolf: Inflation and Bond Market History and Prospects,” AJO, September, 2013. “Nassim Nicholas Taleb: To Prevail in an Uncertain World, Get Convex,” AJO, July, 2013. “Nassim Nicholas Taleb: To prevail in an uncertain world, get convex,” Advisor Perspectives, July 16, 2013. “A visitor from Mars” (interview with David DeRosa), Ounavarra Review, June 2013. “Using an Economic Balance Sheet for Financial Planning,” Andrew Rudd, The Journal of Wealth Management, May, 2013. “Stockman To America: Sinners, Repent!,” AJO, April, 2013. “Stockman to America: Sinners, Repent!” Advisor Perspectives, April 30, 2013. “Ounavarra Review Q2 2013 – Inflation”, 2013. “Tough times for classic value investors,” Advisor Perspectives, February 19, 2013. “The Milton Friedman Centenary: One Hundred Years of Suprisingly Little Solitude,” AJO, February 15, 2013. “The Milton Friedman centenary: One hundred years of surprisingly little solitude,” Advisor Perspectives, February 12, 2013. “The ‘New Finance’: Illiquidity, The Liquidity Premium, And Liquidity-Preserving Strategies”, Ounavarra Review, February 2013. “A Pension Promise to Oneself,” with Stephen C. Sexauer, AJO, 2013. “A Pension Promise to Oneself,” with Stephen C. Sexauer, Financial Analysts Journal, 2013. 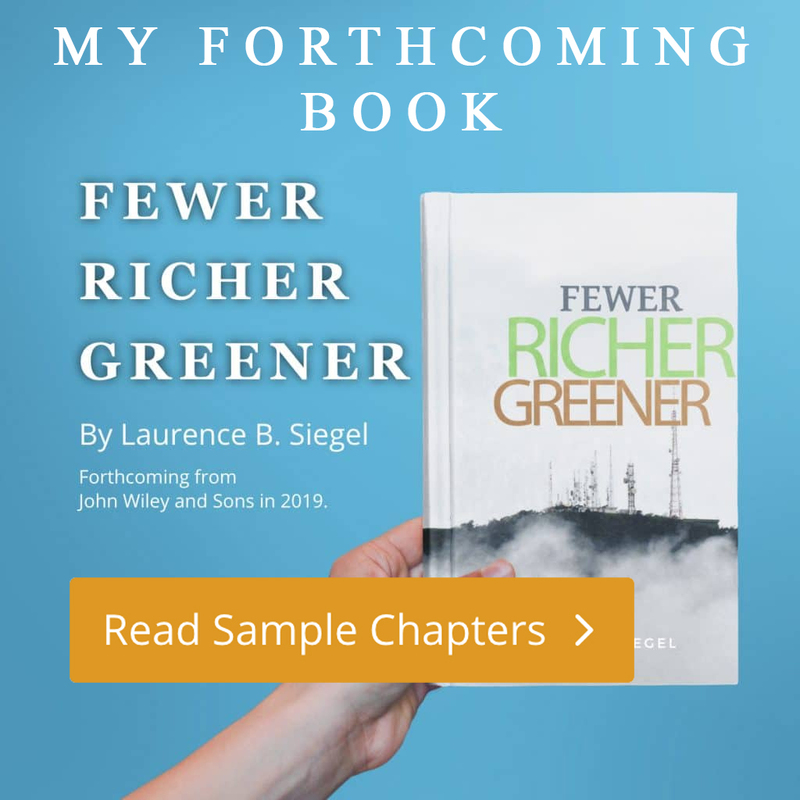 “Fewer, Richer, Greener: The End of the Population Explosion and the Future for Investors,” Summarized by Rodney N. Sullivan in Enterprising Investor, CFA Institute, December 31, 2012. “Managing Tail Risk,” with Stephen C. Sexauer, Retirement Income Journal, Volume 2, Number 3 (Fall 2012). “The Prospects for Long-Term Growth: A Critique of Grantham and Gordon,” AJO, November 27, 2012. “A critique of Grantham and Gordon,” Advisor Perspectives, November 27, 2012. “Be Kind to Your Retirement Plan – Give It a Benchmark,” with Daniel P. Cassidy, Michael W. Peskin, and Stephen C. Sexauer. Journal of Retirement, June 2012. A shorter version appeared under the title “Be kind to your retirement decumulation plan – give it a benchmark” in Risks and Rewards, Society of Actuaries, August 2012. “Robert Shiller on the social benefits of finance,” Advisor Perspectives, August 7, 2012. “Benchmarking your retirement portfolio with a risk-free strategy,” Advisor Perspectives, July 10, 2012. “Daniel Kahneman on the two ways of thinking, fast and slow,” Advisor Perspectives, June 5, 2012. “Managing Tail Risk,” with Stephen C. Sexauer. Retirement Income Journal, Fall 2012 (volume 2, number 3). Previously published in the Allianz Global Investors White Paper Series, June 2012. Comment on “Investing for your own and the greater good,” by Paul Woolley. Alliance Magazine, June 2012. “Fewer, richer, greener: Why Jeremy Grantham is (partly) wrong,” Advisor Perspectives, April 4, 2012. “Jeremy Siegel, Rob Arnott and other experts forecast equity returns,” Advisor Perspectives, February 7, 2012. “Michael Lewis on the true depth of the crisis in Europe,” Advisor Perspectives, January 24, 2012. Foreword to Frontiers of Modern Asset Allocation by Paul D. Kaplan. John Wiley & Sons, Hoboken, NJ, 2012. “The Illusion of Precision,” with Stephen C. Sexauer and Paul Pietranico, Retirement Management Journal, Fall 2011 (volume 1, number 2). “A critical look at Obama’s economic team,” Advisor Perspectives, October 11, 2011. “Value investing lessons from Moneyball,” Advisor Perspectives, October 4, 2011. “Byron Wien reflects on his list of surprises,” Advisor Perspectives, September 6, 2011. “Matt Ridley Makes a Case for Optimism,” Advisor Perspectives, August 16, 2011. “A supply model of the equity premium,” with Richard C. Grinold and Kenneth F. Kroner. In Hammond, P. Brett, Martin L. Leibowitz, and Laurence B. Siegel, editors, Rethinking the Equity Risk Premium,Research Foundation of CFA Institute, Charlottesville, VA, 2011. “Risk parity: Classical finance properly implemented, or misunderstood?” Letter to the Editor, Financial Analysts Journal, September/October 2010, pp. 15-16. “First, let’s kill all the liabilities.” Invited editorial comment, Journal of Portfolio Management, Fall 2010. “Black swan or black turkey? The state of economic knowledge and the crash of 2007-2009,” Financial Analysts Journal, July/August 2010. “A riskless society is ‘unattainable and infinitely expensive’,” in Laurence B. Siegel, editor, Insights into the Global Financial Crisis, Research Foundation of CFA Institute, 2009. “Commodity investing and the commodity risk premium.” Draft. 2009. “A tribute to Peter L. Bernstein,” with 20 collaborators, Special Commemorative Section, Journal of Portfolio Management, Summer 2009, p. 19. “Five principles to hold onto (even when your boss says the opposite),” with Matthew H. Scanlan and M. Barton Waring, Journal of Portfolio Management, Winter 2009. Summarized in The CFA Digest, August 2009. “Alternatives and liquidity: Will spending and capital calls eat your ‘modern’ portfolio?” Journal of Portfolio Management, Fall 2008. (Winner of the first annual EDHEC-Robeco Journal of Portfolio Management prize; winner of a 2008 Bernstein Fabozzi/Jacobs Levy outstanding paper award.) Summarized in The CFA Digest, May 2009. Moderator of “The fundamental debate,” by Robert Arnott and Paul Kaplan, Journal of Indexes, January 2009. “Wake up and smell the coffee: DC plans aren’t working – Here’s how to fix them,” with M. Barton Waring and Timothy Kohn. Journal of Investing, Winter 2007. An earlier version was published in Investment Insights, Barclays Global Investors, San Francisco, June 2006 (volume 9, issue 3). A shorter version, co-authored with Barton Waring and Bill Chinery, is in Defined Contribution Monitor (Toronto, Canada), February 2008 (Vol. 4, no. 1). Summarized in The CFA Digest, May 2008. “Are exotic betas worth investing in? A brief note.” All About Alpha (online), October 24, 2007. “Don’t kill the golden goose! Saving pension plans,” with M. Barton Waring. Investment Insights, Barclays Global Investors, January 2007. “Managing institutional investor portfolios,” with R. Charles Tschampion, Dean Takahashi, and John L. Maginn. In Maginn, John L., Donald L. Tuttle, Jerald E. Pinto, and Dennis W. McLeavey, eds.,Managing Investment Portfolios: A Dynamic Process, 3rd edition. John Wiley & Sons, Hoboken, N.J., 2007. “Perspectives on international small-cap stocks,” with Fred Jheon, Barclays Global Investors, 2007. “Who you gonna call? Mythbusters,” Economics and Portfolio Strategy, Peter L. Bernstein, Inc., New York, June 16, 2006. “Five myths about fees,” with Ronald N. Kahn and Matthew H. Scanlan, Investment Insights, Barclays Global Investors, May 2006. “Five myths about fees,” with Ronald N. Kahn and Matthew H. Scanlan, Journal of Portfolio Management, Spring 2006. Also published in Investment Insights, Barclays Global Investors, San Francisco, May 2006 (volume 9, issue 2). (Winner of the 2006 Bernstein Fabozzi/Jacobs Levy best paper award; republished in The Bernstein Fabozzi/Jacobs Levy Awards, Volume 2, New York: Institutional Investor, 2010.) Summarized in The CFA Digest, November 2006. Forewords to (almost) all Research Foundation of CFA Institute Research Monographs, 2006-present. “The Myth of the Absolute-Return Investor,” with M. Barton Waring, Financial Analysts Journal, March/April 2006 (winner of the Graham and Dodd Award for Best Perspectives Piece in 2006). An earlier version was published in Investment Insights, Barclays Global Investors, March 2005. “Debunking some myths of active management,” with M. Barton Waring, Journal of Investing, Summer 2005. Summarized in The CFA Digest, November 2005. “The myth of the absolute return investor,” with M. Barton Waring, Investment Insights, Barclays Global Investors, March 2005. “A herd of cats,” in Barclay L. Douglas, editor, Investing for Institutions: Thoughts on the Bottom Line. Forthcoming, John Wiley & Sons, Hoboken, N.J.
“A new framework for international investing,” with Andrew R. Olma, Investment Insights, Barclays Global Investors, San Francisco, May 2004. “A new framework for international investing,” with Andrew R. Olma, Journal of Portfolio Management, 2004 (30th anniversary issue, volume 30, number 5). An earlier version was published in Investment Insights, Barclays Global Investors, San Francisco, May 2004. “TIPS, the dual duration, and the pension plan,” with M. Barton Waring, Financial Analysts Journal, September/October 2004. (Winner of the 2004 Graham and Dodd Scroll Award.) An earlier version under the sole authorship of Laurence B. Siegel was presented at the Barclays Capital Global Inflation-Linked Bond Conference, Key Biscayne, Fla., January 2003. “The equity risk premium: An annotated bibliography.” Barclays Global Investors, January 2002. “Credit Market Volatility and Change,” with Stephen M. Johnson, The Journal of Investing, Spring 2003. “The dimensions of active management,” with M. Barton Waring, Investment Insights, Barclays Global Investors, December 2002. “Value investing after the growth bust and value boom,” Journal of Investment Consulting, June.July 2002. “The changing U.S. bond market: Implications for portfolio management and benchmark choice,” with Stephen M. Johnson, INVESCO Research Summary, Atlanta, second quarter 2001. “It’s 11 p.m. – do you know where your employees’ assets are?” with M. Barton Waring and Lee D. Harbert, Investment Insights, Barclays Global Investors, October 2001. “Analyzing the greatest return stories ever told,” with Scott W. Clifford and Kenneth F. Kroner, Investment Insights, Barclays Global Investors, San Francisco, July 2001. “The greatest return stories ever told,” with Kenneth F. Kroner and Scott W. Clifford, The Journal of Investing, Summer 2001. Investment Management for Endowed Institutions, with Clinton L. Stevenson, 1999; second edition, 2001. Translated into Chinese by the China Association of Science Foundations. “Making sense of the markets’ madness,” Journal of Investment Consulting, December 2000. “Mind the gap! Why DC plans underperform DB plans, and how to fix them,” with M. Barton Waring and Timothy Kohn, Investment Insights, Barclays Global Investors, San Francisco, April 2000. “Dow 36,000 and all that,” Investment Policy, September/October 1999. “Jeremy Siegel talks with Larry Siegel,” Investment Policy, September/October 1999. “The case for international investing,” with Patricia C. Dunn and Andrew R. Olma, Investment Insights, Barclays Global Investors, San Francisco, May 1999. “Investment of planned gifts in the era of the prudent investor rule,” with Eric I. Swerdlin, Journal of Gift Planning, January 1999. “Market neutral investing: Industry background and prospects,” with Elizabeth R. Hilpman, Baring Asset Management, Boston, 1998. Available from the authors at lbsiegel@uchicago.edu orliz@barlowpartners.com. “Is small-cap investing worth it? Two decades of research on small-cap stocks,” with Eric Clothier and Barton Waring, Investment Insights, Barclays Global Investors, San Francisco, December 1998. “Are Stocks Risky? Crashlet of 1998 Edition,” Barclays Global Investors, September 1998. “Waking up to the risk of equity investing,” with Lawrence G. Tint, Investment Insights, Barclays Global Investors, San Francisco, September 1998. “Inflation hedging in a low-inflation world: The plan sponsor’s rationale,” in John B. Brynjolfsson and Frank J. Fabozzi, eds., Handbook of Inflation-Indexed Bonds, Frank J. Fabozzi Associates, New Hope, Pa., 1998. “Jeremy Grantham talks with Larry Siegel,” Investment Policy, May/June 1998. “Ford: Living with lower returns,” Plan Sponsor, April 1998.
Review of The New Money Masters by John Train, Investment Policy, March-April 1998.
Review of The New Venturers: Inside the High-Stakes World of Venture Capital by John W. Wilson, Investment Policy, September-October 1997.
Review of Inflation by Michael Jefferson, Thomas Mann, Andrew Dickson White, and Walt Rostow, Investment Policy, July-August 1997. “Inflation and investing: An overview,” Investment Policy, July-August 1997. “Are stocks risky? Two lessons,” Journal of Portfolio Management, Spring 1997. “The $40 trillion market: Global stock and bond capitalizations and returns,” in Peter Carman, ed., Quantitative Investing for the Global Markets, Glenlake Publishing Co., Chicago, 1997. “Iced grande latte, no fat, no foam,” Lookout Mountain Hedge Fund Review, third quarter, 1996. “Derivatives strategies for endowment and foundation portfolios: The fund perspective,” in Managing Endowment and Foundation Funds, ICFA Continuing Education Series, Association for Investment Management and Research, Charlottesville, Va., 1996. “Stocks, bonds, and bills after taxes and inflation,” with David Montgomery, Journal of Portfolio Management, Winter 1995. “Computing discount rates for valuing bank assets,” with David G. Clarke and Michael J. Mattson, Bank Accounting & Finance, Spring 1995. “Portfolio Theory is Alive and Well,” with Paul D. Kaplan, The Journal of Investing, Fall 1994. “Portfolio Theory is Still Alive and Well,” with Paul D. Kaplan, The Journal of Investing, Fall 1994. “Tasa de descuento: Aplicación de técnicas avanzadas de valuación financiera a mercados nacientes,” with David G. Clarke, et al. ; translated into Spanish by Jorge A. Suárez, and distributed by Sociedad de Ingenieros Civiles Valuadores, A.C., Mexico City, January 1994. Also published as “Discount rates: Applying advanced financial valuation techniques to emerging markets,” Business Valuation Review, June 1994. “Taming your optimizer,” with Scott L. Lummer and Mark W. Riepe, in Global Asset Allocation: Techniques for Optimizing Portfolio Management, Jess Lederman and Robert Klein, eds., John Wiley & Sons, New York, 1994. Translated into Japanese and published by the Security Analysts Association of Japan. “Portfolio insurance and tactical asset allocation: A new look,” Gestion Collective Internationale (published by FICOM, Paris), July-August 1993. “GSCI collateralized futures: A hedging and diversification tool for institutional portfolios,” with Scott L. Lummer, The Journal of Investing, Summer 1993. “The global stock market explosion,” with Mark W. Riepe, Financial Markets Institute, University of Iowa, 1992. “Equity scorecard,” Investing, various issues (most recently Summer 1990). “Stocks, bonds, bills, and inflation around the world,” with Paul D. Kaplan, in Managing Institutional Assets, Frank J. Fabozzi, ed., Harper & Row, 1990. “World equities: The past and the future,” with Roger G. Ibbotson and Paul D. Kaplan, in Global Portfolios: Quantitative Strategies for Maximum Performance, Robert Z. Aliber and Brian R. Bruce, eds., Dow Jones-Irwin, 1990. “Introduction to international equities,” with Roger G. Ibbotson and Marvin B. Waring, and “Introduction to international bonds,” with Robert A. Brown, in Quantitative International Investing, Brian R. Bruce, ed., Probus Publishing Co., Chicago, 1990. Guest author, Economics and Portfolio Strategy, Peter L. Bernstein, Inc., New York, November 1, 1989. “The state of the art in estimating cost of capital,” Chief Financial Officer USA (1988 edition), John Thackray, ed., London: Sterling Publications Ltd., 1988. “Suppose the market goes nowhere,” Investment Management Review, May/June, 1988. “International equity returns,” with Roger G. Ibbotson, in Carl R. Beidleman, Handbook for International Investors, Chicago: Probus Publishing Co., 1987. “The income method of valuation: Perspectives on the discount rate,” Proceedings of the National Tax Association Annual Conference, 1986. “Investment returns on stocks, bonds, and bills,” with Roger G. Ibbotson, in The Dow Jones-Irwin Business and Investment Almanac, Sumner N. Levine, ed., 1986; updated annually for a number of years. “Return to equity and return to debt in the ad valorem tax valuation setting,” with Roger G. Ibbotson, Proceedings of the 1985 Public Utilities Workshop, Wichita State University, 1985. “Real estate returns: A comparison with other investments,” with Roger G. Ibbotson, American Real Estate and Urban Economics Association Journal, Fall 1984. “Risk, taxes, and marketability in a macro-consistent capital market equilibrium,” with Jeffrey J. Diermeier, Proceedings of the Seminar on the Analysis of Security Prices, Center for Research in Security Prices, Graduate School of Business, University of Chicago, May 1983. Foreword to Roger G. Ibbotson and Rex A. Sinquefield, Stocks, Bonds, Bills, and Inflation: The Past and The Future, Charlottesville, Va.: Financial Analysts Research Foundation, 1982. “A Framework for Understanding Bond Portfolio Performance,” December 10, 2013. “Nassim Nicholas Taleb: To prevail in an uncertain world, get convex,” July 16, 2013. “Stockman to America: Sinners, Repent!” April 30, 2013. “The Milton Friedman centenary: One hundred years of surprisingly little solitude,” February 12, 2013. “Tough times for classic value investors,” February 19, 2013. “A critique of Grantham and Gordon,” November 27, 2012. “Robert Shiller on the social benefits of finance,” August 7, 2012. “Benchmarking your retirement portfolio with a risk-free strategy,” July 10, 2012. “Daniel Kahneman on the two ways of thinking, fast and slow,” June 5, 2012. “Fewer, richer, greener: Why Jeremy Grantham is (partly) wrong,” April 4, 2012. “Jeremy Siegel, Rob Arnott and other experts forecast equity returns,” February 7, 2012. “Michael Lewis on the true depth of the crisis in Europe,” January 24, 2012. “A critical look at Obama’s economic team,” October 11, 2011. “Value investing lessons from Moneyball,” October 4, 2011. “Byron Wien reflects on his list of surprises,” September 6, 2011. “Matt Ridley makes a case for optimism.” August 16, 2011. “Sometimes There Really is a Wolf: Inflation and Bond Market History and Prospects,” November 2013. “A visitor from Mars” (interview with David DeRosa), June 2013. “The ‘new finance’: Liquidity, the liquidity premium, and liquidity-preserving strategies,” February 2013.